After an elusive search for over two years trying to find an Amertek engine to photograph, I finally located this one that had just recently entered service with the Keystone Wildfire Crew. 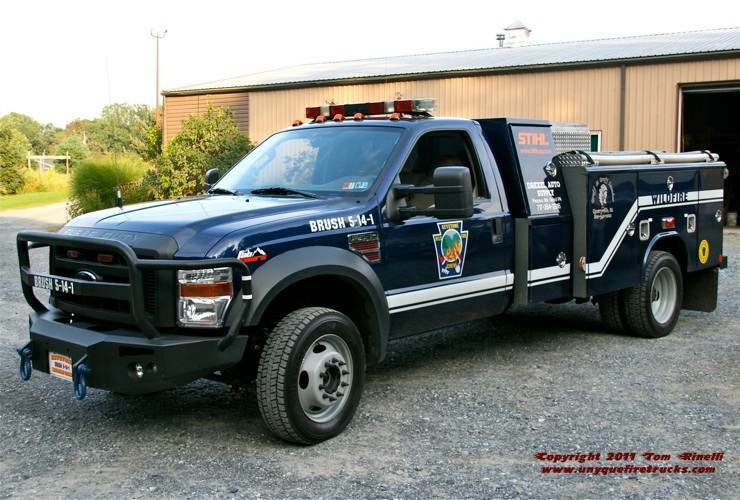 In keeping with my motto of “Every Fire Truck Has A Story”, this rig certainly lived up to that with quite a story of how it was acquired and modified to fit Keystone’s unique response needs. 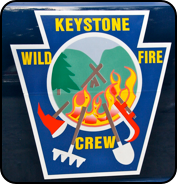 Originally established in 1984 as a satellite support crew, Keystone Wildfire Crew provides wildland firefighting support in the southeastern portion of the state. 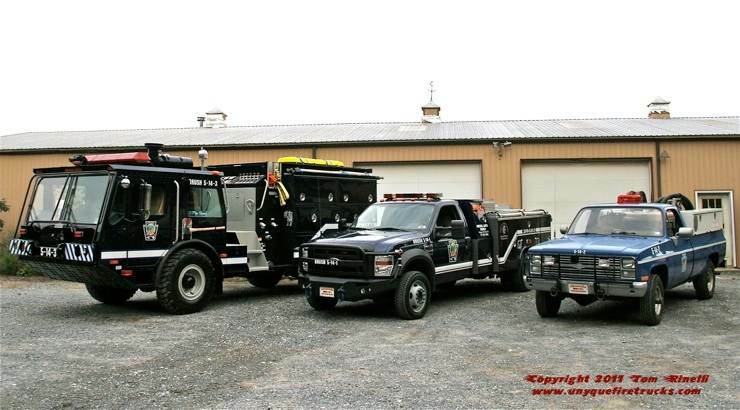 Serving District 17 encompassing nine counties from Lancaster to just outside the city of Philadelphia, the crew’s 55 members (up from just 18 members only three years ago) respond to an average of 5 to 15 incidents yearly. Seventeen members are also qualified for out of district response where they must be self sufficient for a minimum of 72 hours. Keystone Wildfire Crew operates their fleet from a two bay garage at the Fort Pine Fire Base outside Rawlinsville in the southern portion of Lancaster County. Unlike a typical firehouse with a Dalmatian, Keystone’s mascots include roosters, chickens, dogs & steers!! This is the first firehouse I have ever visited where there was a rooster crowing in the yard!!! 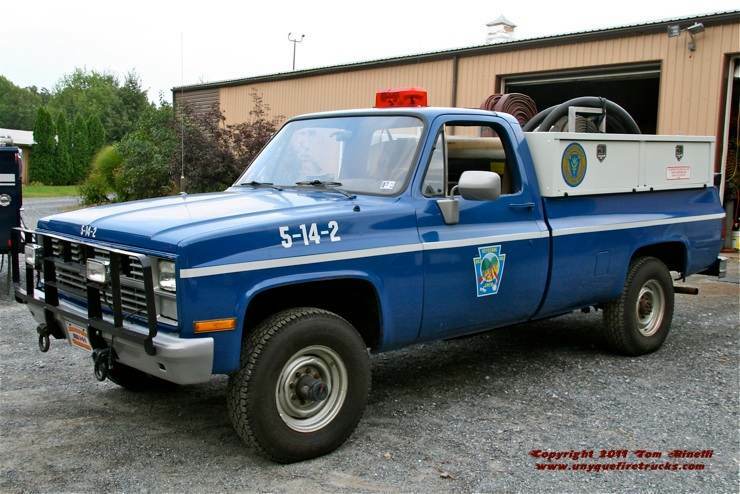 The original (and at one time the only) response vehicle, this military surplus rig is provided on loan through the Bureau of Forestry and is equipped/staffed by the volunteer members. It is equipped with hand tools for 13, over 2,000 feet of 1-1/2” hose, a floating dock strainer and 2-1/2” suction hose. Brush 95-1 - 2008 Ford F550 4x4/Reading 34 HP-450 PSI/300 gal. The primary response unit, this rig was built by the members and financed through $250 yearly subscriptions advertising local businesses. 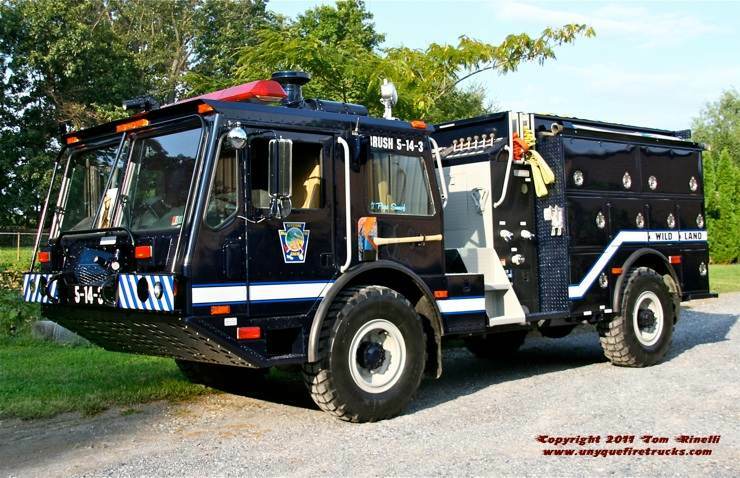 Featuring a manual transmission, it is equipped with a custom manifold (plumbed to the gas tank) that can draft, relay, circulate and fight fire simultaneously. It’s equipment complement includes hand tools for 25, a portable pump, 3,000’ of 1” to 2-1/2” diameter hose, a backpack leaf blower and an 18” Stihl chainsaw (provided in exchange for advertising). Special thanks to Keystone Wildfire Crew Secretary Sheron Shank, Squad Boss Chris Shank & crew members Kris Enterline, Adam Enterline, Zad Leggett & Ron Cariello for their tremendous hospitality in arranging this visit, positioning the apparatus & providing information on the crew’s unique operations. Also, a very special thanks goes out to Squad Boss Jeremy Culbertson for the opportunity to allow me to experience a ride through the Lancaster County countryside while buckled into the officer’s seat of this rig!! !